Tips and tricks to fix HTC U ULTRA / OCEAN NOTE. This is bigger screen HTC smartphone which have 5.7 inches LCD size. That is why at some country HTC U ULTRA use product name as HTC OCEAN NOTE. This phone comes in the market using dual simcard slot which can run using GSM or CDMA, but for broadband connection HTC U ULTRA / OCEAN NOTE use 4G LTE at GSM network. 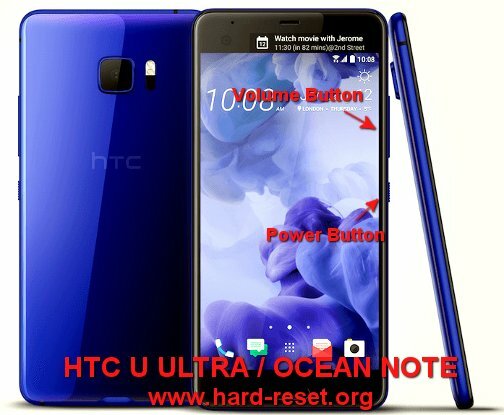 Find more information about how to solve problems of HTC U ULTRA / OCEAN NOTE at www.hard-reset.org community. The HTC U ULTRA / OCEAN NOTE will do the master reset for several minutes, just wait until it finish. How to Make Battery of HTC U ULTRA / HTC OCEAN NOTE Stronger, Life Longer and Not Fast to Drain ? Battery is very important to make this phone can work for several hours. The battery of HTC U ULTRA / OCEAN NOTE use 3000 mAh capacity, for 5.7 inches LCD screen is not too big. Therefore we have to do some adjustment if we want to make HTC U ULTRA / OCEAN NOTE battery work more longer before recharge. First we have to know that LCD screen is consume a lot of battery capacity when it is on such as watching movie or playing games for several hours. Please do some adjustment like make LCD screen brightness as low as possible. How to Easily Master Format ACER LIQUID Z6 with Safety Hard Reset?